Bought a B7 1.8T Cabrio the other day, got it cheap as a bit of a 'daily-commuter-project' as I call it..... Higher mileage and a few little gremlins that I'll get round to sorting but it's a really nice car and I think it has bags of potential and cost me the bangernomics sum of £1250. My biggest issue at the moment is the location of the dipstick and dipstick tube.... specifically, it doesn't appear to have one. The seller (who was selling on behalf of his wife) said it doesn't have a dipstick, it's a level sensor and against my better judgement I took his word for it. I don't think he was trying to con me, just hadn't driven/owned the car and therefore didn't know. 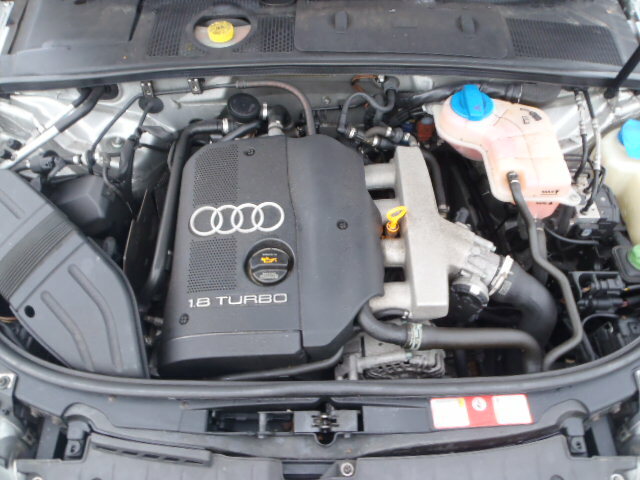 Probably should have done some more checking though, I've owned a B6 with this engine and know for a fact it has a dipstick. Anyway, there's absolutely no sign of the dipstick, or dipstick tube and there's no way of checking the oil level right now.... other than when the level sensor comes on to moan at me. Currently, it hasn't, but I'm still not happy. So, first job, let's work out where my dipstick should be and get that sorted. Hopefully it's lot spewing oil or sucking contaminated dirt into my oil, which is my biggest worry. It's the BFB engine which means this below is roughly what the engine bay should look like. Therefore the dipstick should protrude from the centre of the manifold. Now that could be the tube, but I have reservations..... I thought the dipstick tube was metal until the top in-which it is plastic, that tube looks like rubber (don't hold me to that). It's also been plugged by a fairly sizeable socket bolt and I'm concerned removing it to install a new dipstick tube could cause sealing issues. What are peoples thoughts on this? Is that definitely where the dipstick should be? Do I need to replace that part as well? Some answers here would do me the world of good as I'm a little bit afraid of driving it. Very glad Audi stuck in a pre-idiot warning light. So I've almost certainly answered my own question, yes, that is the dipstick and yes it's been plugged by that ridiculous bolt. I mean, who and why? An aftermarket plastic replacement part is like £5 delivered. To be fair, it's not leaking at all which probably means I am okay to continue driving it, but it means I am entirely at the mercy of the oil level sensor which I consider an idiot tool. I'd be lying if that doesn't make me feel somewhat uncomfortable. Are they prone to failure? The pipe at the bottom, as I suspected is indeed metal but there is some kind of rubber extension on top.... which I suspect is also replaceable. This part is then connected to the plastic extension. - Remove the bolt, install the new dipstick tube, dipstick, check it seals, take it for a short drive and then do an engine flush and oil + filter change. Then at least all the crud that was sent into the sump will either drain out or be caught by the old filter. It doesn't help that the BFB engine seems to be kind of 'rare' on A4's, yet I've somehow owned bloody two of them. They're either rare or nobody makes videos for them because plenty of the videos of how to do this job, the replacement tubing is actually on the outside of the manifold and looks like a dead straightforward job. Having it on the inside, actually makes this look quite an awkward job to do. Surely it's not a manifold off job? I can get my hands around the rubber pipe, so it could be a case of an extension to my ratchet through the inside of the manifold then feeding the new pipe down and just doing my best to push it as hard as possible? If it's just an interference fit and there's no clamp then that should be possible. This thread suggests there might be some kind of O-Ring on the inside of the rubber piping. Slightly concerning really. There's a temptation take it my local Audi specialist and just ask what his thoughts are. Past experience on other makes would tell me it's a push fit with an O ring preventing oil loss. I've seen lots of Vauxhall's with broken dipsticks where the plastic bottom of the dipstick catches on the bottom of the metal dipstick tube and breaks off and falls into the sump. The fact that's been blanked off with a bolt would worry me. Yeah, makes sense, just not sure what else to do? I'm not particularly all concerned if there's bits of plastic fallen in. I will flush it and if needed I'll take the sump off. My concern is the rubber pipe. It could be utterly trashed. Is it possible to source a replacement? The alternative is i run it on the idiot and pre-idiot light only? Not ideal. Car definitely needs some TLC that's for sure. Finding little issues here and there. But I believe I can get it running good again. (It already runs ok). There's a temptation to get the cambelt done next month and ask them to fit it when there's more room. Some more issues fixed, but still haven't got round to this. I'm honestly not sure how best to approach it. Friend of mine doesn't think it's been screwed in but physically hammered in, which might well have deformed the pipe. I need to have a cambelt done at some point (just because I don't trust other people to do this **** correctly). So I am thinking.... come summer, perhaps get the cambelt done and ask the garage to look at it? They have to remove a fair amount to change the cambelt don't they? It's not losing oil (i'm monitoring using the level sensor in VCDS) but at the same time, I don't trust not having a dipstick. Never have, never will. Help, where to locate ecu & OBD PORT? Anyone know where to locate the 75x post?